ओबेसी ने मोदी जी को ललकारा दम है तो हैदराबाद में रैली करके दिखाओ, ज़बाब में मोदी जी जो अधिकांश जगहों पर तो सुरक्षित कार से रैली करते है पर हैदराबाद में पैदल रैली निकाल कर सबकी बोलती बंद कर दी। (Owaisi challenged Modi ji saying if you have guts come to Hyderabad and do a rally, in response Modi ji, who would conduct a rally from his car at certain places, has shut everyone up by taking out a rally on foot in Hyderabad- translation). Along with the above message, a video has been shared widely on social media platforms. The video shows Prime Minister Narendra Modi walking down a street flanked by cheering citizens. The duration of the video clip is 30 seconds. It has been claimed that the video is from Hyderabad. The above tweet by a user Ashok65 Chowkidar has been retweeted almost 1400 times since it was tweeted on April 16. 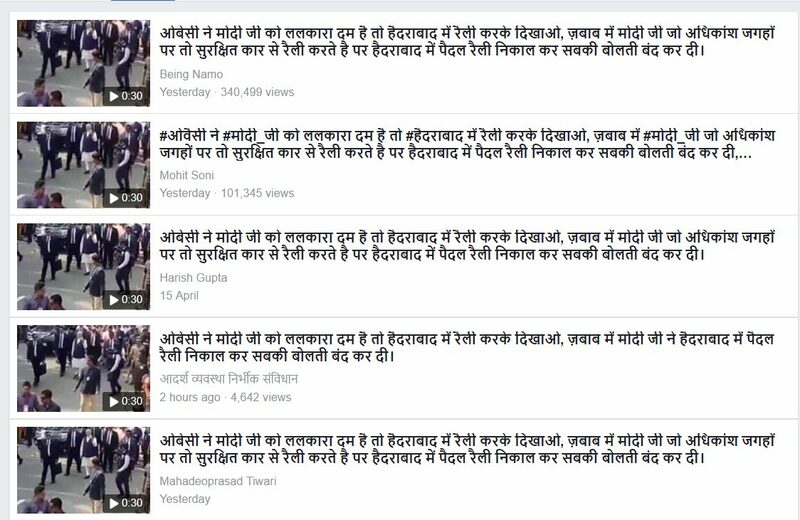 A facebook page Being Namo has posted this video on April 16, it received over 342,000 views. On Facebook, several users have shared the video and copy pasted the text on their timelines. This suggests that the video and message are being shared on WhatsApp as well. The claim that the video is from Hyderabad is false. It is actually from Gujarat and was taken in December 2017 when Prime Minister Narendra Modi had arrived in Ahmedabad to cast his vote for the assembly election. PM Modi had voted at Ranip in Sabarmati, following which he had conducted what the opposition called a ‘roadshow’, alleging violation of the Model Code of Conduct. The event was expectedly covered by the media. There are several news reports available on YouTube. Alt News found that the same video clip was posted back in December 2017 by a pro-Modi Twitter user, when PM Modi had cast his vote in Ahmedabad. Moreover, it is rather evident from the video itself that it cannot pertain to a recent event. PM Modi is seen flashing his inked finger in front of the crowd. This suggests that the video is old, since the Prime Minister is not registered as a voter in Hyderabad, if at all one were to believe the claim. A video of December 2017 from Gujarat has been shared as PM Narendra Modi’s rally in Hyderabad. This is a false claim.